A few months ago, I reconnected with an old school friend on Facebook. We had been good friends whilst we were at secondary school back in the 1980s, but had lost contact over the years. I have photos of the two of us on the school field together which are kept in my loft, and posted them on a group of which some of my old school friends were members. It didn't’t take long to get a comment along the lines of ‘Look at us!’ and there was my friend Jane, with a new and very long surname which started with a Z. Conversation went on, and I found out that Jane was running an educational charity about an hour outside Accra, in Ghana, in a small village called Kokrobite. The Kokrobite Chiltern Centre (the Chiltern part coming from the hills where we both grew up) had been set up to increase the availability of education to the children, and to get as many as possible into school. Jane was living in Kokrobite with her husband. I met with Jane when she was next in the UK to pass on some old books from the school library that I thought she might be able to use, and asked if there was anything that I could do to help. We talked about the problems that were faced by the educators in Ghana, and hatched an idea that I could come to Ghana to talk to teachers specifically about developing the teaching of Literacy in Early Years. I LOVE Early Years so was more than happy to share what I know with the teachers, so I booked a flight and here I am! Mr Livingstone (who was a year 3 teacher at Britwell last year) came as well – he was going to share his knowledge of Literacy in Key Stage 2 with the teachers, too. We caught an extremely busy and rather bumpy flight from Heathrow the day after the end of term. When didn’t know quite what to expect when we arrived in Accra, but we flew into a new airport terminal which had great air conditioning, and, although we had to wait a couple of hours to get past passport control and collect our luggage (we had 4 very heavy bags full of stationery items for Jane, plus some sweets and peppermint tea), it was cool and stress free! A good start to our trip! We walked outside and the heat hit us. It was quite late at night, but very humid and very warm. I was still wearing a jumper! Jane met us with her friend April, who luckily had a car with airconditioning (and a big boot!) and drove us out to the village. It took about an hour – the roads started off as we know them at home – with tarmac, straight, well lit and busy. We had some fresh plantain chips – a bit like Pringles but hopefully count towards your five a day. Delicious! As we continued out to the village, the roads became narrower, and bumpier, and less well lit. We drove through small towns which were alive with music, people and children – even though it was now quite late at night. Eventually, we reached Jane’s house, and unloaded our bags, gave Jane her peppermint tea and sat down for a moment for a chat and a catch up. Then off to bed for a busy day tomorrow! I slept well, with the fan on and the windows and curtains open to make the most of the breeze. ‘You’ve got a great view from this room’ said Jane, but it was dark so I will have to wait until the morning to see it. I slept quite well, but woke up early. The sun started shining in my room at about 4am, and as it was Sunday, there was lots of singing and music coming from the church which started quite early in the morning – it sounded great! It was a beautiful day – so after a quick (cold and refreshing – there’s no hot water here) shower, went down for banana pancakes for breakfast, with Ghanaian honey. Jane had two other guests who were leaving this morning – they had been working on a project for SEN children in the area. 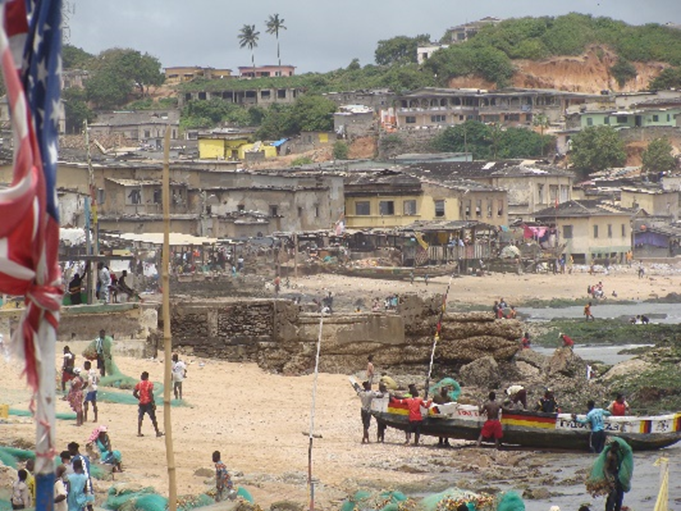 For one of the guests, it was their first time in Ghana, but the other had been coming to work with (and living with) the community for the last 20 years. When we had finished helping with the washing up, we got in a car to visit a couple of the schools. We drove down the same roads that we had last night in the dark – it all looked very different in the day time! There were goats, chicken and dogs roaming the streets, people selling all sorts of things, but most people were walking to or from church wearing their best clothes. There was singing coming for all directions as we drove to the school. Jane’s husband is super clever and has built classrooms with plastic bottles, and he took us to see them (he also built their house, too). The school had some classrooms which had walls, and some which were open air. Part of the school was being used for a Church service, so there were lots of people around, children and their parents, wandering in and out of the service. We could here the singing and the pastor preaching, but we quietly slipped in to the empty classroom. It was possible to see the bottles in the roof which Jane’s husband had used to build the classroom – but it was sturdy and cool (quite dark) but it didn’t look anything like a classroom at Claycots! It was filled with wooden desks, which sometimes sit three children at a time, and had a few posters on the walls, as well as two white boards (but not the interactive kind). The children had all sorts of exercise books which were kept in a pile by the teacher’s desk. There were a few pencils, but no light and bright windows, no resources, no books and no computer. It was very, very different to the schools and classrooms that we have in Slough. After we had had a look at some of the other classrooms – which were the same, but had lots more desks in them – some of the classes have 70 children in one class with one teacher – we went to look at the desalination plant and aquaponics system that Jane and her husband are putting in. We saw a play park which they had built from recycled materials and tyres, and also a football pitch that some other volunteers had made. Then we went down to the beach. On the way, we walked through a residential area, which was where many of the villagers lived. There were lots of people about, many wearing their best Sunday clothes, but it was very, very different to being at home. The houses were just one room, where a family had to do all their cooking and sleeping. Jane said that sometimes the children need to sleep outside as there’s no room in the house for them. This means that they are more likely to be bitten by mosquitos and catch malaria. There was no sanitation, so no toilets. The families had to get water from a tank by the bucket (which costs about 20p a bucket) and use all this water for washing and cooking. There were some children washing from a bucket beside their houses, lots of women washing clothes and hanging them on the washing lines, and chickens everywhere! It was extremely hot and sometimes a bit smelly. But everyone smiled and said hello to us, and lots of the children knew Jane because they come to her house to do their homework and to play in her yard on a Saturday morning. Many of the children, Jane’s charity pays for them to be able to go to school, so they were all really pleased to see her! It was even hotter now and very humid - so we found a small bar right by the beach to have some water. Mr Livingstone had a bottle of freshly squeezed pineapple juice, which looked delicious. 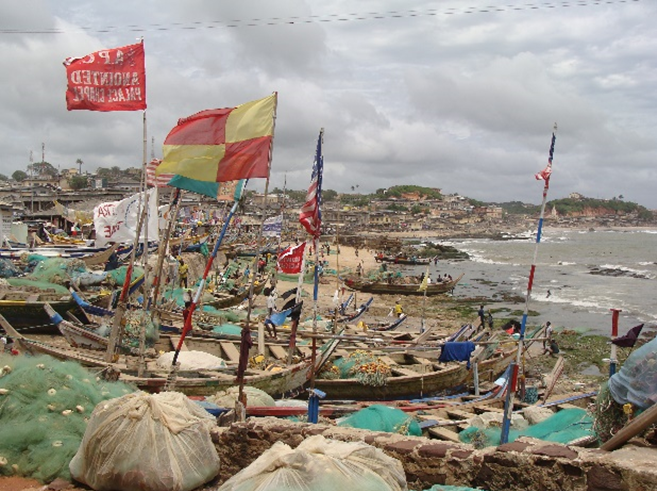 The beach was very busy, filled with backpackers and other people who had come out from Accra for the weekend. There were a couple of fishing boats on the sand, with the fishermen fixing their nets, and women selling that day’s catch from big silver bowls which they had balanced on their heads. They had all the tools to prepare the fish for you, on the spot. Jane’s husband bought some grouper fish for tea. There were a few stalls selling souvenirs and children surfing in the waves using old planks of wood for surf boards. There was a man cooking kebabs on a barbeque, and there was also a very competitive game of volley ball going on! After we had our lunch, we made our way back up the dusty road to the house for the afternoon. Later in the afternoon, Jane was watching Strictly Come Dancing – a great luxury as most of the houses don’t have electricity, or running water, or toilets or televisions. Strictly is a few weeks behind where it is at home, too. Half way through, suddenly the power went out! This happens quite regularly, so Jane had lots of lanterns that she was able to get quickly, and was still able to cook tea using the gas in the kitchen. We ate our tea by the light of the lanterns! After dinner, we went up to the terrace by the bedrooms – we had to cover ourselves in insect repellent, so that we weren’t bitten by mosquitos, to avoid catching malaria. I thought about the village children who were sleeping outside with no protection from insect bites. Jane and her husband are trying to produce a range of mosquito netting which can be put up like a cage, so that the children who are sleeping outside can have some protection. Their dedication, innovation and determination to do the best of the community is outstanding. Suddenly the power came back on! We had had no electricity for three hours, so quickly had a cold shower before bed to cool down whilst the lights were working! I’m typing this underneath the fan in my room and eating plantain chips! Tomorrow we are off to see the schools whilst the children are in them – so a busy day! Good night! Over night there was some rain – it sounded to me like it was raining very heavily, but Jane says that is just light rain – even though, when I got up, the ground was dry and hard again, even though it had been raining a couple of hours before. I had a fresh banana for breakfast, and then we got a car to visit some schools. The seat belts in the cars don’t work, so we were a little bit anxious about any accidents – but the drivers are quite careful and drive slowly, partly because the roads are so poor, it’s not possible to go quickly at all. When we arrived at the first school we met the headteacher who was called Ben, and he took us to the Kindergarten classes (which are the same as our Nursery and Reception). The children were all sat at desks, and the teacher’s desk was outside the classroom. There were some phonics posters on the walls, and some letters and sounds hanging from washing lines in the classrooms, but none of the resources that our children know – no sand, no water, no playdough – the children were writing in books, copying from the board and sitting at desks, and they are only 4 years old. There was a older year old girl in the KG2 class (the same as our Reception class) as she had specific needs, but there was no support for her, so she was staying in this year group rather than being with children the same age. Jane in is the middle of a project with SEN specialists from the UK to improve the outcomes and provision for these children, so hopefully this will change in the near future. The children were very excited to see us, and they spent a long time stroking my hair! We also looked at some of the year 1, 2 and 3 classes – the children were copying from the board into their books, without talking. The teachers were copying what was in their text books onto the board for the children, and if the children didn’t have a book (the parents have to supply all the books and pencils) then they would just have to watch. There were 3 children sat on a bench and desk that was only really meant for one or two and for some children, there was not enough furniture so the children had to lie on the sandy floor to copy into their books. The teacher would sit at a desk at the back of the classroom, marking books and not really engaging with the children. Children who didn’t do as they were asked, could be hit or caned by the teacher. But the children all had yellow and brown uniforms, which they wore with pride, and they were very smiley and friendly. When Jane saw a teacher with a cane, she took it and snapped it in half! 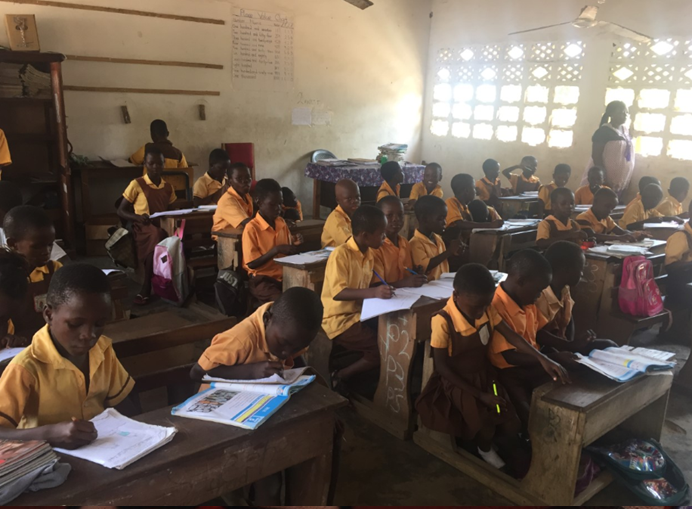 Corporal punishment is illegal in Ghana, but sadly it still happens – Jane and the headteachers are working really hard to eradicate this, and use different methods of behaviour management in the classrooms. We went to visit another 3 schools, which were all similar. The children were universally friendly and pleased to see us, and once they had over come their nerves, were happy to have a chat and tell us about their learning. 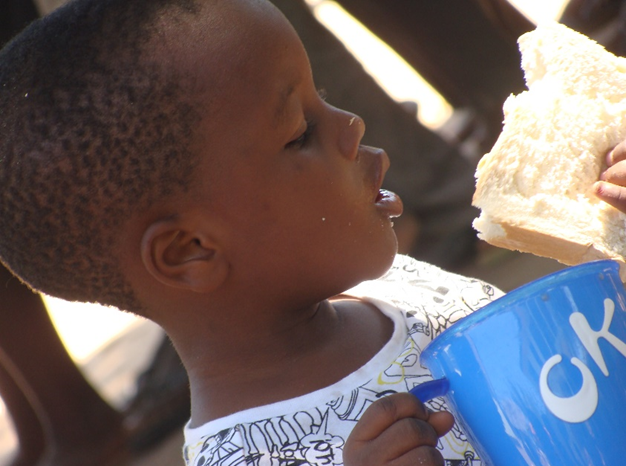 Some of the children were eating lunch of rice or noodles which they had in small metal bowls, which was served to them in the playground. There were no fences around the schools, and no teachers to supervise their playtimes. When we came back to the house, we spent some time talking with Jane about what we could do to help, so tomorrow we are going back to two schools to observe the teaching and to start to see if we can do some work with the teachers to improve the environment for the children. IN the afternoon, we had to go to the bank to change our money – we bought more plantain chips in the traffic, and loved the aircon in the bank - on the way back, we stopped at a stall to buy the vegetables for tea. When we got back, the Learning Centre in Jane’s back garden was opening – it is open after school every day and on Saturday mornings so that the children can come and do their homework, read, play games or play outside. 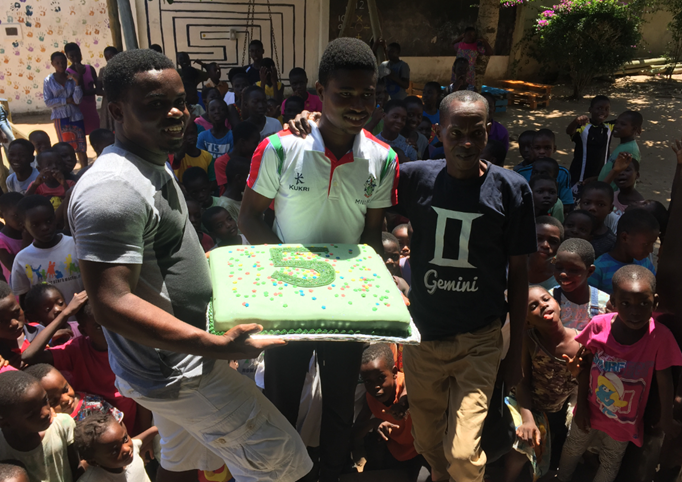 There are two people – Francis and Engineer – who run the Learning Centre in the afternoon, and it’s much more like a classroom as we know it, packed full of books (some of which came from our school library), games and puzzles. The children can get help with their homework, read to an adult and have a drink. I read with some children, played games and taught them to play dominoes. The children come every night, so I hope to see them tomorrow, too. The Learning Centre closes at 6 so that the children can walk home before it gets dark. Some of the children were picked up by a motorbike taxi, and others walked home with their friends down the tracks that leave the house and go back towards the village. Some of them were only 5 years old. We had tea, and there were some very noisy frogs in the garden! Jane spent the evening finalising the number of people who are coming to our workshops later in the week. And we finished watching the Strictly Come Dancing which we missed yesterday when the power went out! This morning we went back to two of the schools where we had been tomorrow to observe the teaching. I was very much thrown in at the deep end by having a class of Reception children to teach as soon as I arrived! It was quite tricky … the children could not understand what I was saying, and they were very lively - they spent a lot of time fighting with each other instead of listening. We took the chairs and tables outside and did some counting using bottle tops – but the children found it very tricky to share and to work without fighting with each other! Then I went to another school and saw a really lively phonics lesson - the teacher was fabulous, and worked so hard to engage the children – they all showed progress, and were writing working with /g/ - some of them were only 3 years old. It showed that children can still learn and make progress independently even with very few or no resources, as long as the teacher is enthusiastic and engaged. A lesson to us all! We came back to have some lunch before we went to the largest shopping mall in Africa in the afternoon to buy some material and to go to the supermarket. Prices in the supermarket were very expensive – it was £11 for a small bag of broccoli. We bough a few things that came to nearly £100. On the way back, we stopped to get some water (Jane buys big cases of water as we can’t drink the water which comes out of the tap. We need to use bottled water for cleaning our teeth, too). Then we came back to the house in time for the children to come to the learning centre for the evening. I spend a couple of hours reading and singing with the children, before they left to get their motorbike taxi or to walk home. We had kele wele for tea, which is deep fried and spiced plantain (which is a big banana) with curry and rice – delicious! I have a really busy day tomorrow delivering a workshop for some local teachers, so I spent some time looking over my resources and making sure everything was ready. We only have a small power cut today, too! And it wasn’t quite so hot. Today was the day of my first workshop which I presented to a group of head teachers, and the Director General of Education for the region. I had prepared well for it at home and last night we had set up the tables and made sure that the laptop was working. 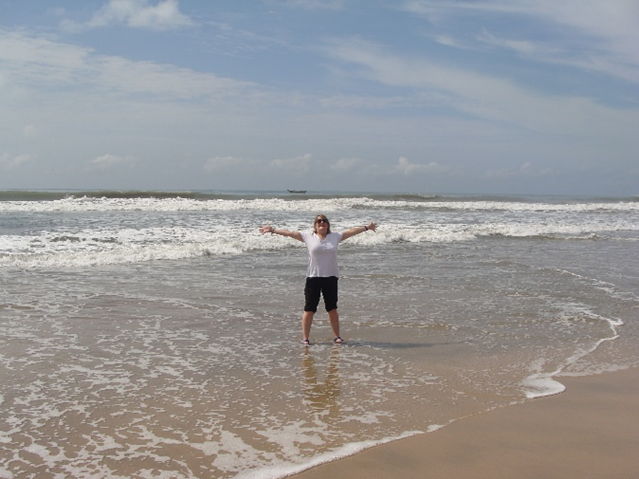 As we are near the sea, it was quite tricky to get the laptop terminals on the screen to work – they corrode quickly because of the salty air – but with a little bit of sandpaper and some good luck, we were able to connect in time for the arrival of the teachers. I had brought with me some British sweets – humbugs, fudge, chocolate eclairs – and had to explain to the teachers what rhubarb and custard were! It was a little bit different to conferences at home, because some people brought their babies with them – but they were really good all day! The workshop went really well – everyone was quite quiet when we started but by the end of the day, were all joining in. 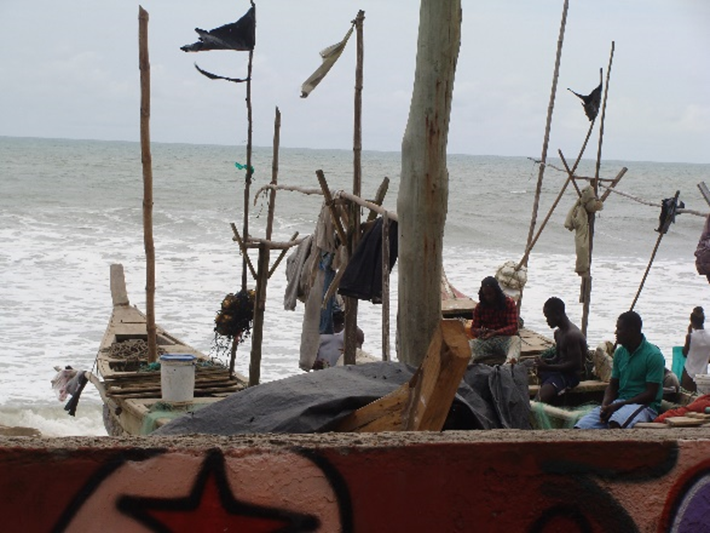 I learnt some Ghanaian rhymes and heard some local stories, so it was learning for me, too. The feedback was great, and the teachers said that they would try some of the techniques in their classes – so we will go back next week to check! When we were tidying up, I noticed that many people had just thrown their rubbish onto the floor – even though there is a bin in the Learning Centre. In Ghana, there is no one to collect the rubbish, so there are no bins in the streets, so rubbish just gets thrown onto the ground. As a result, there’s a big problem with waste in the environment – especially plastic waste, and small, black plastic bags which are everywhere – there is no way to recycle at all, which is very sad. After everyone had gone, I spent the evening reading with the children from the local schools when they came to the Learning Centre, and then we went out for dinner. On the way, the rain came … all of a sudden, it was really windy and then a torrential downpour. Whilst we were choosing our pizza, the power went again! This was the third time that they power had cut out in four days. Luckily, the restaurant had a generator, but when we got home, there was no light in the house. Because there was no power, it wasn’t possible to work the fans either, so it was really, really hot, which made it difficult to sleep and I was very tired after such a busy day. This morning I was woken up at 4am by the call to prayer, and then singing from the church which went on until I got up at 6am. There was still no power. We went very early for a trip to the Monkey Forest, where a man called to the monkeys in the forest, and then fed them bananas. The man who fed the monkeys was hoping to become self-sufficient, so he was growing his own fruit and vegetables – including courgettes! There was a stream running close to the monkey forest, where the local villagers were busy gathering water for the day. They took it in big silver bowls which they balanced on their heads. It was very clever! I am going to try to buy a big silver bowl in a market before I come home – I’d like to put it in our mud kitchen and see if we can balance it on our heads, too. 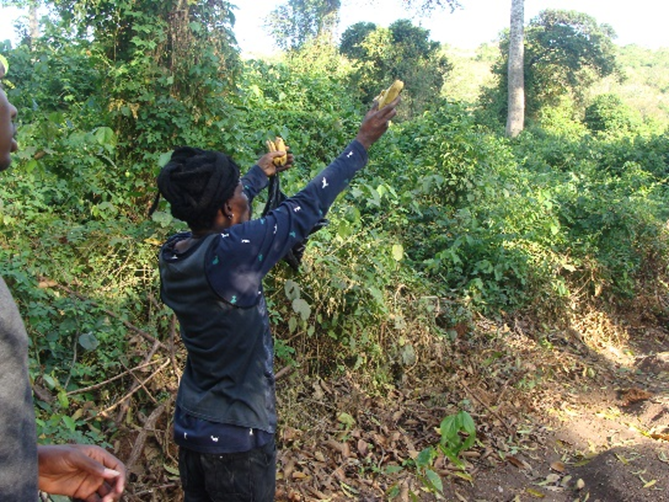 The man from the forest explained that the villagers were also building a wall to stop the dirty water getting mixed up with the clean water. It was really busy at the stream – the real centre of the village, and everyone was laughing and smiling as they filled up their water for the day. Calling the monkeys with bananas. Collecting water at the stream. After the forest, we went for a boat journey on the lagoon. The lagoon is an area of salt water trapped behind some sand dunes – on the other side of the sand dunes is the Atlantic Ocean. We went in a fishing boat onto the lagoon with a man who was going to take us the island on the lagoon where he was living. There were no life jackets for the fishing boat, and the man was bailing out using an old vegetable oil container because the boat had a hole in it ‘I’ll fix it tomorrow’ he said. Anyway, we made it to the big sand dune and went over it to have a paddle in the Atlantic Ocean. As we were coming back to the boat, the man asked us if we wanted to see a sea turtle. Which of course we did. The turtle was resting inside a very small shelter made from banana leaves and bamboo. When we looked closer, we could see that it had a bit of string around its flipper and was tied to a stick. The man said that the fishermen had caught it that morning, and were going to come back to eat it for dinner later. I wanted to untie the turtle and let it go, but I couldn’t. It was very sad. We got back in the boat, and went to the island. On the way, we saw some cages made from bamboo which were on sticks, about 50cm out of the water. The man told us that these were to catch fish – which seemed a bit strange as they were out of the sea. Then the man said that this was because the dam at the top of the hill was emptied when it was full and all the water would rush down the mountain into the lagoon. Then the water would rise and the fish would get trapped in the cages. But the water would also flood the homes in the villages. When we got to the man’s island, his house was built on stilts about 3m high, so that when the dam is opened, his house doesn’t get flooded. On his island he had a lot of ducks and some crabs in a cage. He also had a very large turtle head on a wall, which he thought was amazing, but I thought was a very sad. When we got back from the island to the village on the shores, we noticed just how much plastic waste there was on the side of the lagoon – tonnes and tonnes and tonnes of it. I am going to try really hard to never use a plastic bottle again – they take 450 years to degrade in the sea. 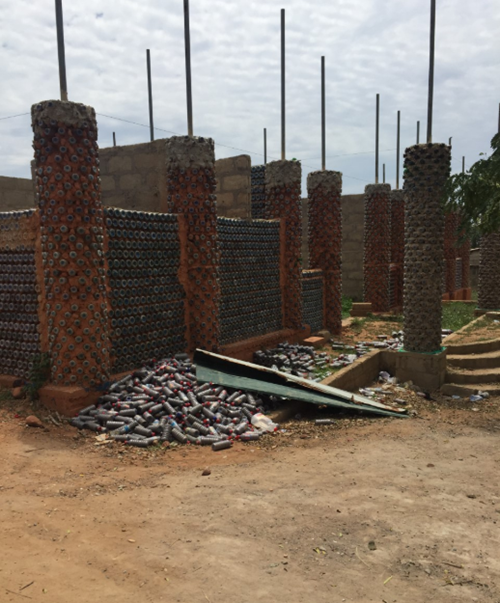 Jane’s husband is using the bottles to make bricks and build classrooms, which is a really good way to use them – but there were so many of them just washed up on the shore – it was shocking. When we came back from the island, we went to the Arts Centre in Accra, where we looked at the men making the African drums. I bought some small balls tied with string which were in fact an instrument – I had a go playing them but it was incredibly difficult (even though the man who was selling them made it look really easy) – so I will give them to Miss J and see if she can play them! When we were driving back, we saw the children from one of the schools that we had visited earlier in the week. They had had a sports day with the other schools in the district and were walking back. There was no teacher with them, they were walking on the main road where there are no pavements, walking back to school all by themselves! And it was a really long way. Without a risk assessment! It really makes you think about how privileged and safe our children are in Slough. On the way back, we went to the seamstress’s house because we had some fabric to make into a dress as a present from Jane – and then when we got home, I was straight in the Learning Centre to spend the rest of the day with the children. We were reading a story about a guinea pig – I had to try to explain what one was, because I don’t think that there are many guinea pigs in Ghana! And finally the power came back on, too! I cooked macaroni cheese (my favourite) for tea, and then came to bed – it has been a very long day today, and we have another workshop with the head teachers tomorrow. Today was Mr Livingstone’s workshop - he had 24 head teachers and KS1 and 2 teachers, who all learnt about how to plan a series of literacy lessons by using a book- it was a great day with lots of activities and everyone there was really involved. At the end of the session, Mr Livingstone gave all of the teachers a book to keep. This book will be the ONLY book in most of the classrooms. Jane gave them all paper and pens so that the could write ideas from the children and keep for a sort of working wall, and the teachers had to use the book to plan a series of lessons. The teachers had no experience with planning – usually the teacher reads from a text book, and copies text onto a board, and the children copy it into a book (if they are lucky enough to have a book). This was completely new to them, and they needed a lot of support. We are going back to the schools next week to see how this has been implemented in the classrooms. After the workshop, we spent the evening with the children at the centre again. I was playing a game with a group of children, when I realised that there was a child there who I had not seen before. She was finding it very difficult to play the game, and couldn’t count or follow instructions. She told me that she was 10 years old, but was still in year 1. I asked one of the workers at the centre about her - she had arrived recently from another, more remote region of Ghana and was staying with her step mother. She did not speak the local language, or English, and came from a village where there was no electricity. She was obviously very behind with her learning, but also had some special educational needs too – but instead of supporting her, the school just put her in a year group 5 years lower than she should have been. This is so sad and helps no one, not the child, not the other children in the class and not the teacher. There is no SEN support for children in Ghana. Jane is working hard on a project to put some SEN support in place for children and teachers, but at the moment, there is nothing, so the children like the girl I spent time with today, have very little chance to reach their potential. There was a group of boys at the Learning Centre this afternoon who were doing their homework. I went to give them a hand, and they told me that they were doing ICT homework. This involved writing the letters on the middle line of a key board, or writing how to boot a computer. This would have been very easy homework if they had access to a computer - but there are no computers at school and none in the home, so the children learn ICT and write it in a book without any experience of using it practically. Luckily I have my lap top with me, so let the boys use it for their homework. Initially, there was some disagreement about whose turn it was, but we worked out a way to make sure it was fair, and they all had a go at typing, adjusting a font and putting their previous learning into practice. They had been told how to make text bold, and how to underline it, and had written the instruction to do this in their books. But they had never had the experience of doing in themselves. When I turned on my laptop this evening to write this blog, I found the letter that one of the children had written (I have crossed out the names myself). I want to tell you three main thing about my school. Firstly, they have brought many white ladies and teachers to the school for teaching us. Secondly, they have planted many trees for giving us air. Sometimes at break me and my friend steal some of the fruit to eat. Thirdly, the headmaster has told the carpenters to make beautiful chairs for us to sit on. I am ending here because I and my mother are going to make a special dinner for tonight. I’m really pleased to see that they have used their knowledge of underlining and making a font bold! I’m also pleased that the carpenter is making them chairs, because not all of the children at school have a chair to sit on. Often they don’t have a desk, either. And if they are lucky enough to have desk and a chair, they need to share it with 2 other children, so it’s very difficult to write anything as there is so little room. We have had power all day today! Another whole day with power! There was some rain in the night, but the power stayed on, which is great as that means that the fan is working in my room, so it’s not quite so hot. Today the children came to the Learning Centre to play. 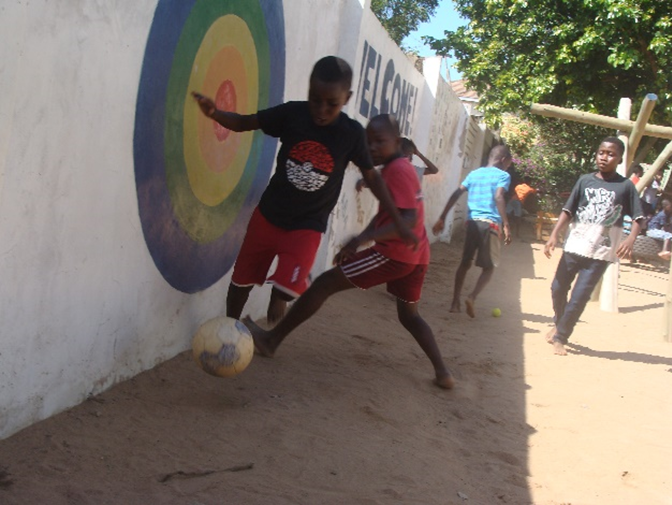 There were almost 170 children who arrived – they spent time playing football, chalking on the wall, swinging on the tyre swing, playing a game of finger football with a bottle top, using stools as African drums (they were really good!) and just generally being kids for the day. 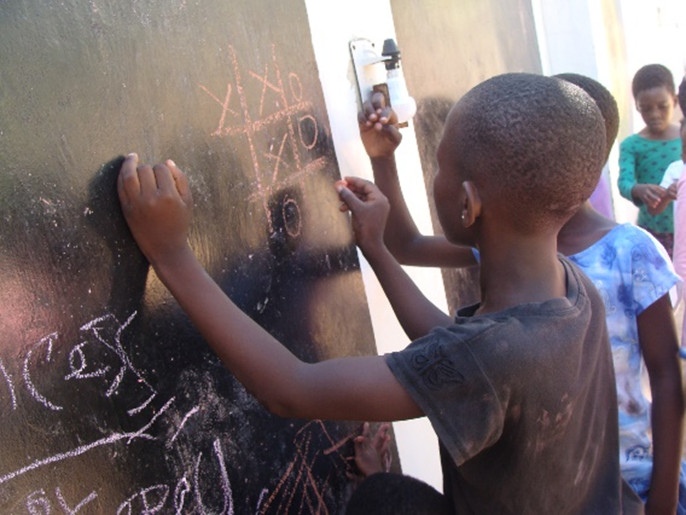 I taught some children to play noughts and crosses, and learnt some African clapping games with the children. The Centre gives them breakfast of bread and tea (which is actually hot chocolate) and then I read a story to some of the little children, whilst the older ones did some tie dying, and hama beads. The session starts at 9, but children start to arrive between 7.30 and 8. Children who come are aged between 3 and about 18 – even the 3 year olds get dropped off without their parents, and then have to walk home with their friends. 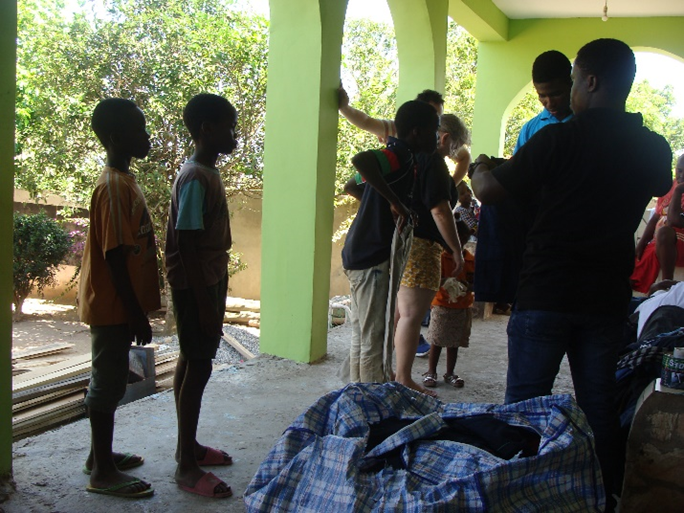 Before they went home, we gave them all some clothes which had been donated – everyone got one piece of clothing to take home, either a Tshirt, or jeans, or a jacket. Jane gets quite a lot of donations, so the children are very lucky. When they had finally gone home (about 2 o’clock) some more children from the village, who hadn’t been to the session in the morning, started to arrive to ask for clothes too. Saturday morning football – leather ball, bare feet. In the afternoon, Jane was telling me a bit more about her water project. She has built a desalination plant and a bore hole, and is hoping to start pumping water from the ground, and then purifying it and selling it cheaply to the villagers. 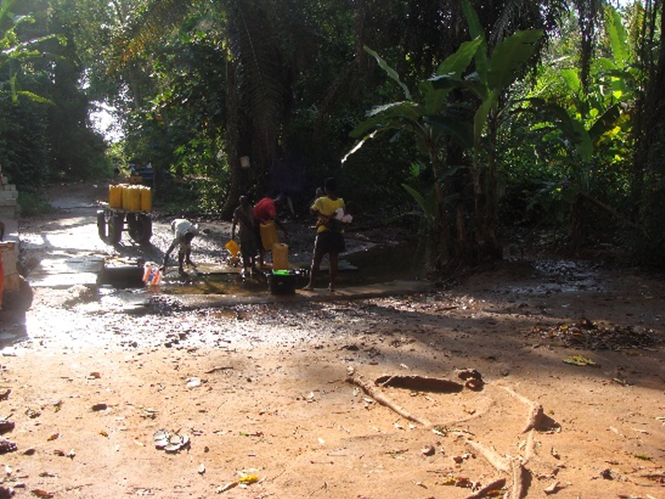 At the moment, the villagers either go to a water source (like the stream that we saw earlier in the week) or get their water from the water tanks in the village. This water is not very clean, so it has to be boiled before it can be used. Jane’s water would already be clean enough to drink, and also it would be cheaper than the tank water. There is an engineer coming from Germany in November to do the next part of the project, and they hope to start pumping water early in the New Year. For the rest of the day, we were able to relax a little bit, which was good as it has been a really busy week. Next week looks even busier! So we need to rest while we can! Good night! Today we went to church. The vast majority of Ghana’s population are Christian, and Sunday morning church is a big event in the community. Sometimes, church goes on all night! So, we decided that we wanted to go to church so that we could see how the villagers spend their Sundays. There are lots and lots and lots of churches in Kokrobite, so we chose to go to Presby (the Presbyterian church) which is held every Sunday in one of the classrooms of the Presbyterian school, which was one of the schools that we visited a couple of times last week, and who sent teachers to our workshops. It’s a private school although the facilities (or lack of them) are very similar to the state schools – apart from the teachers don’t have to be qualified, and the class sizes appear to be a bit smaller. Still the classrooms have extremely limited resources, if any at all, no displays, no computers, no white boards, no pencils or pens (other than the ones that the students bring in), no carpet (just a bare earth floor), and very basic wooden desks with chairs (that sometimes need to be shared). The playground has no fence around it, so children could leave at any time if they wanted to. When we arrived for church, everyone was wearing their Sunday best. Children were wearing dresses, shirts, trousers, shoes (no flip flops), then men were in suits and the ladies were wearing beautiful dresses. We were welcomed at the door by a church warden, who tried to persuade us to sit at the front but we preferred to sit at the back. There was some preaching, in two different languages (none of them English) and some singing. 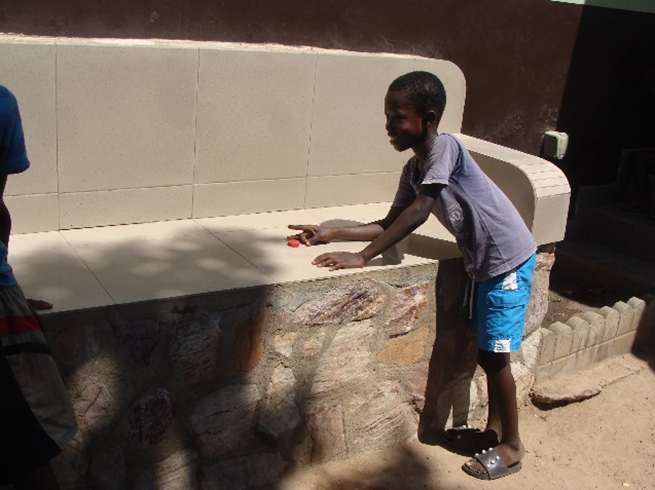 There was a small band – one of the boys who helps Jane at the Learning Centre was playing the drums – and there was a choir, a keyboard player, some African drums and a several tambourines. The singing was great – everyone was dancing in the aisles and waving white handkerchiefs as they danced and sang along. We had to give an offering (of money) depending on what day we were born – there were big, metal bowls at the front of the church with the days of the week on them, and when the day that you were born was shouted out, you had to go up to the front to put money in the bowl. I have no idea which day of the week I was born, so chose Wednesday as it’s in the middle of the week! We also had to go up to the front of the church and tell the whole congregation why we were there! People cheered and clapped! The church was in a classroom of the school, but it looked very different today! There were ornate drapes at the back of the room, hanging from the ceiling to the floor. There was a red carpet on the floor, big posters of Jesus, and a very elaborate clock. There were wireless microphones, a table for the important church people and a pulpit for the preacher. It’s amazing that the church was able to have these things but not the school!!! We walked back to the house – it was really hot. On the way back, a small boy on a red bike stopped us – Mr Livingstone recognised him as one of the children who had been at the Learning Centre yesterday. We told him that we liked his bike ‘Madam Jane gave it to me’ he said proudly. He was also wearing a helmet, which was wonderful to see. In the afternoon, we went back to the beach where the fishermen were still mending their nets, and hundreds of children were enjoying a Sunday afternoon at the beach by swimming in the sea with all their clothes on. We listened to some African drumming and watched some African dancing, and there was also English football on in the bar. We walked along the beach where we saw some children playing football. They had a very old and tattered tennis ball which was falling to pieces, and were using two halves of an old pair of scissors dug into the sand to mark the goals. They were very competitive! There were also children surfing in the waves, using old planks as surf boards. We had a pizza on the way home (very tasty) and then came back for an early night as we have a very early start tomorrow to get to the rainforest. Today we were up super early to go to the rainforest. We got picked up at 5am, and it was pouring with rain. The rainforest is quite a long drive away, but mostly because the roads are so bad. When we got there, it was still early so we had breakfast before we went into the forest to walk along a rope bridge that was 40m up in the air and 350m long. I don’t really like heights, but I was very brave (with some persuasion) and got to the end. 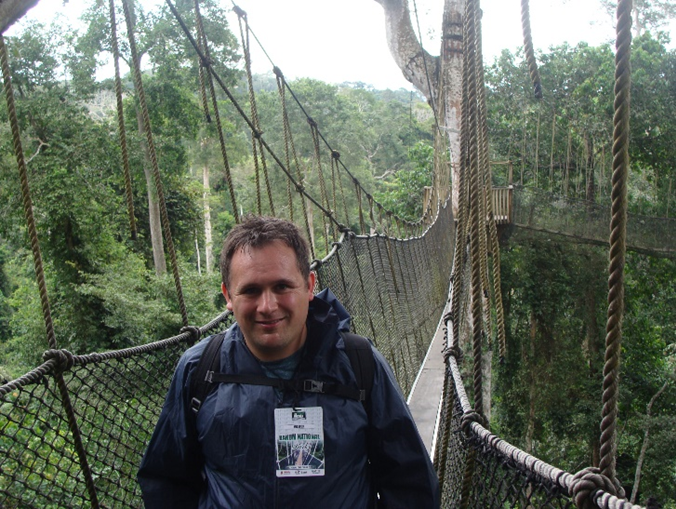 Mr Livingstone looks a lot happier about crossing the bridge that I was! We then went to Cape Coast Castle, which was where the Ghanaian slaves were kept before they were shipped to American and the Caribbean It was a very thought provoking, sad, powerful and heart breaking place to go. You can google it if you want to read all about it – everyone should know what happened there. The way the Ghanaians were treated is shocking, and sadly it didn’t get any better when they reached America. It’s a very horrid part of British history. We had a long journey home, but we made sure that we were back in time to spend the afternoon with the children at the centre. I played the game ‘Frustration’ with the children – it’s their favourite this week, and is great for helping them with their counting skills. Also, the children really need a hand learning to share. They are much more physical with each other than the children at Claycots, and need to be reminded often to use kind hands and to take turns – sometimes their preferred method of communication is to hit or slap their friends rather than talk to them. We have been working really hard on this all week with them by playing games, taking turns, reminded them to use kind hands as well as using educational games to extend their speaking and listening, as well as their maths. ‘Frustration’ is a great game for helping with counting, number recognition and taking turns, and the children have started to deal with the disappointment of losing a game well. The children have very little exposure to these sorts of games – there are certainly none at school and probably none at home either, so it’s all a great experience for them. Their maths and English are learnt by rote, without any chances to critically think about their own learning, so it’s a joy to see them starting to use their skills in the Centre after school. We also did a big jigsaw together – we need to work on that a bit more, as they were struggling to match the pieces and find all the straight edges. There were also children who wanted to read and needed help with their homework. We are spending so much time with the children, I think it is going to be very hard to say goodbye at the end of the week! This morning we had another super early start to get to the market to buy all the ingredients for lunch for the workshop on Wednesday. Jane’s husband took us with Kowaa, who is the cook who makes the lunch. We were up at 4am, and it was still dark, but it took us nearly 2 hours to get to the market because the traffic was so heavy. Everyone was going to work in Accra – the minibuses were full, there were motorbikes everywhere, and people walking – even though it was still dark. There were even children walking to school (by themselves) at that time of the morning. When we got to the market, Jane’s husband went to get some of the vegetables and left us in the car park by the plantain lorries. Because we aren’t locals, he said that we would push up the prices of his vegetables! We stayed next to a lorry which was unloading boxes of soap. There were some ladies with planks of wood on their heads, and the boxes were being unloaded onto them. We were able to see the weight of the boxes and worked out that each lady had 56kg of soap on their plank – that’s twice the weight of my very heavy suitcase when I flew over. They were there all day unloading the lorry – wow! There were also some children in school uniform who should have been at school! Jane’s husband is very good at chasing them up, so they disappeared to go to school as soon as he asked them. We spent the afternoon making books for Jane – there is a previous volunteer who makes books for the charity to sell or give to the children for Christmas presents, but they need to be sewn with paper in them. We spent a long time sewing books in the afternoon – but there are still lots more to do before we go home! Jane and Martial hold a huge Christmas party for the children of the village (about 1200 children come, by invitation only) on the last Saturday before Christmas. They have dancing and African drumming, everyone gets something to eat (chicken and jollof rice) and every child gets a present. We need to help with wrapping the presents before we go home, too. Jane and Martial also go out on Christmas morning to the local villages to give presents to the children who don’t come to the party – they really are amazing! In the afternoon, there was also a delivery of bottles to the house. Someone in Accra had been saving plastic bottles for Martial to build his classrooms and delivered 20,000 bottles in a truck. Martial needs 7,000 bottles to make a classroom, so there are almost 3 classrooms now that can be built with their donations. What a wonderful way to use plastic that would otherwise be rubbish. Today was my final workshop with the local teachers and headteachers, as well as some of the education officials of the area. It was a VERY hot day, so very warm in the Learning Centre, even with the fans on. We looked at (among other things) Early Literacy strands, developing fine and gross motor skills, phonics games and planning, practised reading stories to each other, and I learnt some more Ghanaian rhymes and songs. One was about shooting ghosts, so I am not sure that I will be able to use that when I come home! In the afternoon we made playdough to develop our fine motor skills, and kept some at the Learning Centre for the children in the afternoon. They loved it! They were really engaged with their learning, and it was the first time I had been able to properly see them using their imagination, and thinking critically. The children playing with the play dough were aged from 4 to 14 – you’re never too big for playdough! Both the girls and boys played side by side, and their conversation and co-operation was wonderful. It was a brilliant couple of hours with them, exploring mathematical concepts, writing words using magnetic letters as stamps, making models and jewellery – they even tried to sneak some away in their pockets. But we have kept it all for tomorrow so that we can do it all over again. In the evening, we were back to sewing books for Jane’s Christmas presents for the big Christmas party. So far we have sewn 95 books – we have about another 90 to go! So that will be our project for tomorrow night, and Friday night, and then we might have time to start to wrap them on Saturday before we come home. There’s so much to do when you’re working for a charity – it never stops! Jane works such long hours for no pay at all to support these children in school – she really is amazing! First thing this morning, I had a message from my Mum. She was telling me about what was happening at home but mentioned that £40 million was spent on Hallowe’en costumes and sweets yesterday in the UK. £40 million. Just think what could be done with £40 million here …. Water? Sanitation? School books? Teachers? Just a thought …..
Today we went back to Accra for the morning. We managed to find some time to get some souvenirs from the Arts Centre – but I don’t know how we are going to fit them all in our suitcases to go home! After we left the Arts Centre we went to the International School to get some fabric for Jane. Jane is presenting to a conference about safeguarding in a couple of weeks – all the speakers and delegates get a few yards of the same fabric that they need to have made into a top, shirt or skirt. Sometimes these fabrics have the name and date of the conference printed on them. The difference between the International School and the local schools is incredible. The fees are very high, they have air conditioning, resources and are in a walled building with security – much more like the schools that we know from home. There were lots of air conditioned 4-wheel drive cars outside, and it was in a very affluent area, where there were big houses, with high walls and swimming pools. It was a world away from Kokrobite. Or from the rest of Accra. We bought some plantain chips in the traffic (tasty) and then quickly went to see Aunty Vic, the seamstress who had made me a couple of dresses and a top, and would also make Jane a shirt from her fabric for the conference. The dresses that Aunty Vic had made were a little bit big, so she altered them straight away! She runs a dress making shop with 5 young girls who are training to be dressmakers. 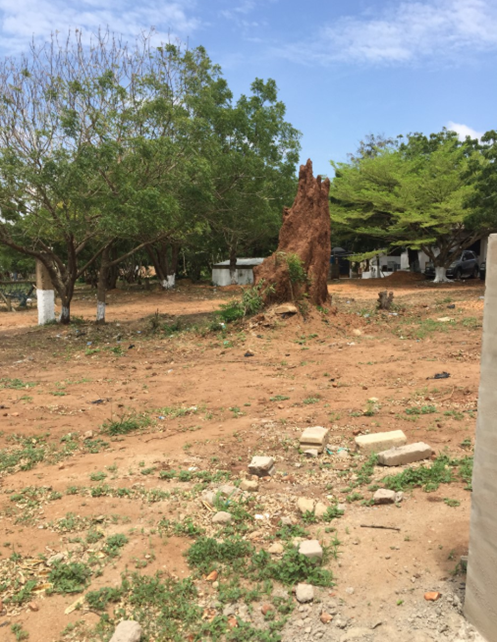 It’s down a track in a village just outside Accra – while we were there, there were chickens and ducks running in and out, and the girls were working on the terrace at the front of her house. Jane always buys a dress from Ghanaian fabric for her volunteers – and I was delighted with mine. See if you can spot it when I wear it to school! The girls were very excited that we had come to see them, and insisted that we all take lots of photos. They especially loved a selfie! On the way back, we bought some more plantain chips in the traffic. If you see something that you’d like – anything from toilet roll, chocolate, water, plantain chips, mobile phone credit – you just shout ‘Plantain!’ out of the window of your car and someone will come with a silver bowl full of plantain chips on their head and sell them to you before the lights change. Today we saw someone selling windscreen wipers, as well. When we got home, it was back to work! We had a meeting with the head teacher of one of the local schools about report writing. Children in Early Years get reports at the end of each term. They are not like the reports that we do at Claycots. The children are given a position where they are in the class, and are given a percentage score for their class work and exams. Yes, that’s right – nursery children (who are 3 years old) have to take exams of some sort at the end of each term. Depending on the results of their exams and their classwork, they may or may not be allowed to go up to the next school year. This means that there can be children who are more than 10 years old in a Reception class, rather than having support to stay with their peers. The children are also graded (A -E) on a number of items, including neatness and using the toilet. We talked to the head teacher about how this might be changed – perhaps to include effort s well as attainment – and also about using positive comments and giving the children next steps. He was very interested to see our reports (all names removed) and the number of comments and observations that went into them. He took some away to see if he can adapt his reports to include some of the same items. One of the problems is that there is not really any access to printers, or computers in the schools, so it would not be possible for teachers to type their reports, and it’s very expensive to print as schools don’t really have a great supply of paper. Whilst we were meeting, it started to rain. We could hear the rain coming from the roads towards the sea – heavier and heavier, noisier and noisier, it arrived with a flash of lightning and a roll of thunder which seemed to be right over the house. And it rained and rained and rained – within minutes the garden was a river, a dark red, muddy river as the rain rushed down towards the gate. In the Learning Centre, the sound of the rain on the metal roof was so loud it was difficult to hear what the children were saying. It rained really heavily for about 20 minutes, then, just as quickly as it had started, it stopped. By now, we were exploring the playdough again (the children had asked for it as soon as they arrived – but the heat of the day had meant that it had gone very sticky, which is not a problem that we have in the UK) so we mixed it with more flour and decided that we needed to keep it in the fridge from now on! The children were still really excited about the playdough – they were using magnetic letter to make imprints and write their names and other words. I was also able to listen to children read – their reading is good, but they sometimes need a hand to understand what they are reading. Many of the books in school have no relation to their life in Ghana, so it’s tricky for them to make sense of what they are reading. When it stopped raining, Jane decided that the children should go home a little bit early just in case it started to rain again. Some of the children have a long walk to get home, so it’s important that they don’t get soaked on the way. When we went to the gate to let them out, we discovered that the rain had brought down an electricity cable across the track. It was just the right height for someone (even a child) to walk into, or to drive into, and it was getting dark – there’s no street lighting so it was very dangerous. We stood by the gate and stopped a few boys from cycling into it, and a taxi from driving into it, as Engineer and Francis (who work at the Learning Centre) tried to find out who owned the cable. Eventually, a man arrived who used the pole that it was attached to, to lift it up and secured it with a broken building block. Let’s hope it doesn’t come down again if it rains tonight, too. After dinner, we spent the evening sewing more books. There’s a lot to do when you run a charity. Today was the last full day in Ghana, and the last one of the workshops which Mr Livingstone delivered to the Key Stage 2 teachers. Meanwhile, back in the house I was on Christmas Present duty! Jane and Martial give out over 1200 Christmas presents each year, and someone has to wrap them, and today that was me! I finished binding the books (we did 185 in total) and then wrapped each one up with a pencil or a pen. It took all day, and still I wasn’t finished – so I will go back to them after the children have gone home tomorrow, before we go to the airport. For lunch I had a mango which I bought from the market earlier in the week. It was the most delicious thing I have ever tasted! Totally delicious … I wonder how many I can get in my bag to take home?? Martial and his brother (who is visiting from Benin) spent the afternoon sorting through some more donations – mostly clothes and shoes for the children. It’s a long and ongoing job but so appreciated by both Jane and Martial and especially the children and families. In the afternoon, we were back in the Learning Centre with the children. I was talking to one girl who was very shy, and had some additional needs, so she was still in year 6, even though she was 13. She nervously showed me her books from school, which were filled with the most amazing drawings (and only a little bit of school work). We told her how wonderful her drawings were – I am not sure that anyone has ever said that before – and then got her some paper and pencils and asked if she wanted to draw some more. At first, she couldn’t believe that the paper was for her, so sat and looked at it for a while, until I demonstrated that she could draw on it. After that, there was no stopping her! She drew wonderfully detailed and well-proportioned pictures of princesses and cats, and quietly coloured them in with great care. I feel so sad that her fantastic talent isn’t recognised and nurtured at school and that she was almost ashamed to show me what she had done. I hope she will be at the Centre in the morning so that we can encourage her even more! The Learning Centre was five years old today! So we went out for dinner to celebrate – Jane, Martial, Martial’s brother who is visiting from Benin, Craig and I along with Francis and Engineer who work there. We had a great time – and Jane gave a little speech about the dream that she has had for the Centre, and how long it took them to get there (Jane was storing books and games for the Centre for 10 years before she had somewhere to put them) and how it’s grown into a great community hub for the children, giving them a chance to do their homework, to have somewhere to go after school, but most importantly, somewhere where they can just be kids and play. Tomorrow we are having cake to celebrate with the children (but it’s a secret at the moment). The cake is being baked by April, who is a friend of Jane’s and one of only 2 lady Uber drivers in the whole of Accra. One of the wonderful things about the Centre, is that on Saturdays (and at the Christmas party), the children who are now too big to come on a Saturday morning (so the teenagers) all come back to help – to hand out breakfast, to wash up and tidy up and to lead the play with the younger children. It’s a great community spirit that Jane and Martial have created. When we came back from dinner, we had to walk home – the roads are dark and very uneven, so it was a bit tricky, but good to see the village on a Friday night – it was quite lively in some places. We were perfectly safe, though - because everyone in the village knows Jane and Martial! As we were walking up the road, Jane asked us to move to the side ‘There’s a big truck coming and they’re not good at stopping or avoiding people’ It was dark, so we moved to the edge, and the truck went past us, beeping its horn. ‘It’s a sand truck’ said Jane. She then told us that the sand was being delivered for building – at this time on a Friday night? Yes, apparently they will deliver when ever they get around to it – a Ghanaian saying being ‘When you arrive is when we expect you’ Jane explained that there is no social etiquette here that stops you phoning someone between 9pm and 8am (unless it’s an emergency) and that she and Martial have had routine calls about things as ordinary as the football training with Martial runs, at 4am! Aren’t different cultures and traditions super interesting? So as my two weeks here is drawing to a close, I have been thinking about the things that I like in Ghana, and the things that I would like to change, improve, or avoid in future! Dealing with the rubbish – collecting it, recycling it or not having it in the first place! Children to learn to be less physical towards each other – kind hands and kind feet! Today was the anniversary party for the Learning Centre, so April had made a cake! The children don’t get cake very often, so it was a real treat for them. 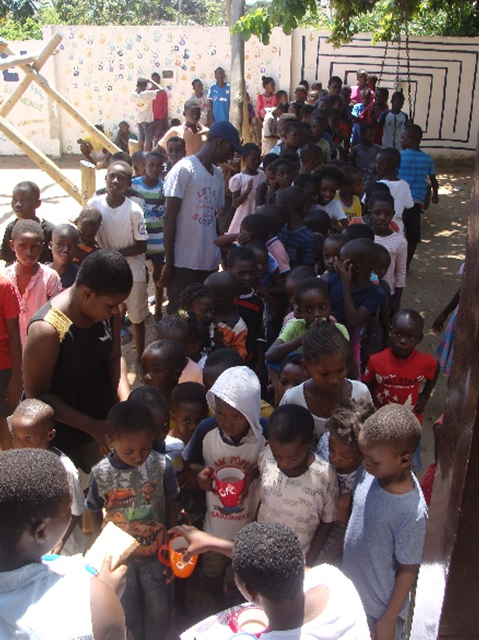 Because we had given out donated clothes last week, this week there were extra children who had come along hoping for some clothing -185 children arrived this morning to play in Jane and Martial’s garden. We had a very long game of Frisbee, made paper aeroplanes with the left over paper from our workshops (we made over 100 planes, and the children played with them all morning, and took them home even though they had seen better days), and read stories to the children. Somehow, Jane managed to cut the cake into 200 pieces, so every child not only had hot chocolate and bread for breakfast, but also had some cake, too. They were very happy! Engineer and Francis who work in the Learning Centre with King Yellow the tie dye expert, and 185 children behind them, celebrate the 5th anniversary of the Learning Centre. We were, of course, very sad to say goodbye when they went – but I know we will be back to see them again. In the afternoon, it was all eyes down to wrap more presents – Jane and I wrapped 185 books with pencils, and a large selection of cuddly toys – the children will be delighted with them when they come to the Christmas party. Eventually, after a heavy afternoon of paper and Sellotape, it was time to go back to the airport. April came with her super airconditioned car, which was very much appreciated as it was extremely hot. We said our goodbyes to Martial, then Jane and April took us to the airport. I have bought a really big bowl for the mud kitchen and couldn’t fit it in my suitcase, so had to borrow the biggest bag you have ever seen from Jane to get it in! (it still arrived a little bit dented, but I am hoping the children will love it anyway). On the way to the airport, we sadly had to pass through a funeral in one of the villages. Funerals go on for several days, and this one was for a young man who had died, so was particularly lively. People were wearing read and black and there was lots of people dancing in the streets. It was quite difficult to get through the crowds – we had to lock the doors of the car, and still people were trying to get in. April did a wonderful job negotiating the people in the streets, and we were soon on our way to the airport. We arrived more quickly that we had anticipated (the hold ups on the main road were not so bad today) but we still managed to get some final bags of plantain chips from the traffic. There is not really much time to drop and say goodbye at the airport, as the officials are very quick to move on the cars, so we had a quick hug and a promise to be back in a year. We managed to check in with only one over weight bag, and eventually settled down on the plane to come home. It was cold on the plane – I had to wear a jumper and shoes for the first time in two weeks. As we took off, the city of Accra and the rest of Ghana was lit up below us - bright, vibrant, welcoming, hot, and sticky. Ghana surely has its fair share of problems, but it was a beautiful place with fabulous people and we have had the very best time. 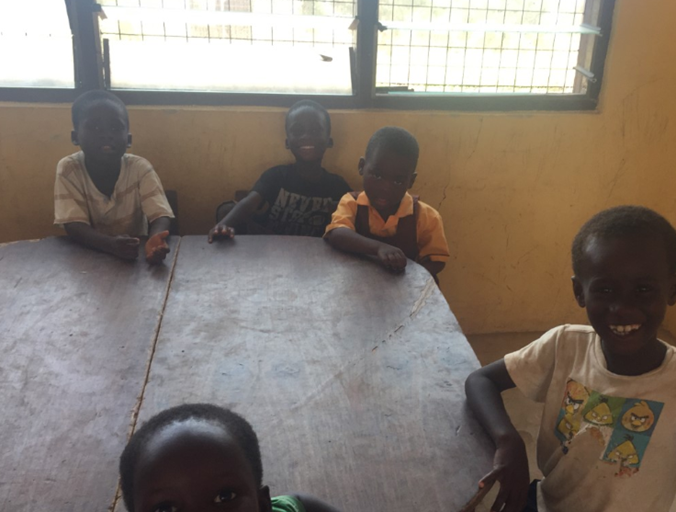 We could not have asked for better hosts, better opportunities to educate both the children and the educators, but most importantly, the children have so much to offer, so much spark and life, so much resilience and independence – it was a joy and a privilege to spend the last two weeks in wonderful, wonderful Ghana. I have realised that firstly, the work that Jane and Martial is never ending and non stop – they NEVER have a day off, and are constantly thinking about the children, all the time. They sponsor children to go to school, work in the community, try to make it a greener and more eco friendly place (their next project is a communal literacy centre in the middle of the town, built from plastic bottles). They are incredibly well respected in not only the village but also the surrounding areas, and quite rightly so. What they do is amazing. Prince Charles was in Accra the same time as us – I want to know why Prince Charles didn’t come to see Jane and Martial – they are truly remarkable people whose commitment and passion should be recognised. Thank you Ghana! We love you so much, we can’t wait to see you again!